This piece by Thomas W. Commeraw reflects the effort of the Black American community to establish itself in New York’s society during the Antebellum Period (pre-Civil War era). New York State failed to pass legislation to emancipate its enslaved population until 1799. This piece of legislation, known as the Gradual Emancipation Act of 1799, did not give immediate freedom to all enslaved Black Americans in New York State. Under this law, only slaves born after July 4, 1799, were freed. Emancipation wasn’t given to all of New York’s enslaved population until 1827. In the North, free Black Americans faced racism, segregation, alienation, and ostracization. In response, Black Americans refused to be discouraged, and they expressed their creativity and cultural identity through the arts. Under the Second Constitution of New York State, White men no longer needed property in order to vote, but “men of color” were still required to own property worth $250 in order to have their political voice counted in the polls. However, Black Americans persevered, and they continued to organize political conventions and used journalism to assert their rights. They created their own schools, places of worship, and businesses. 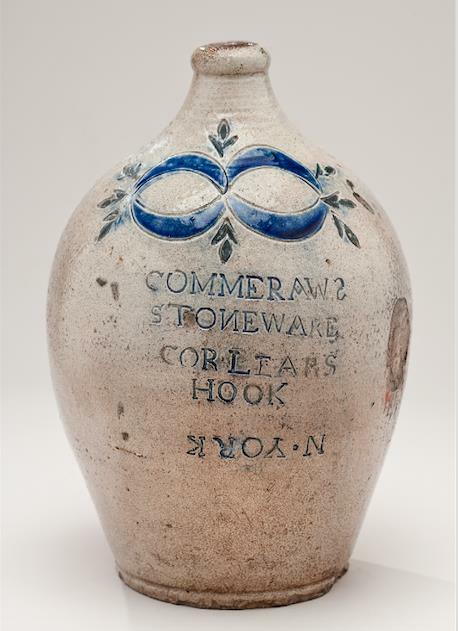 Commeraw, the artist who created this jug, was one of these entrepreneurs. He founded his own pottery shop on the Lower East Side of Manhattan with the intent to create utilitarian pieces (objects that can be used to complete tasks pertaining to daily life). Starting his own business was no easy feat, especially because by 1790, only a third of the Black American population was free in New York. The remaining two thirds were slaves who were subjected to demanding physical labor, constructing the city’s roads, walls, and other forms of infrastructure. Commeraw was an abolitionist and his business was supported and frequented by other leaders of the abolition movement. 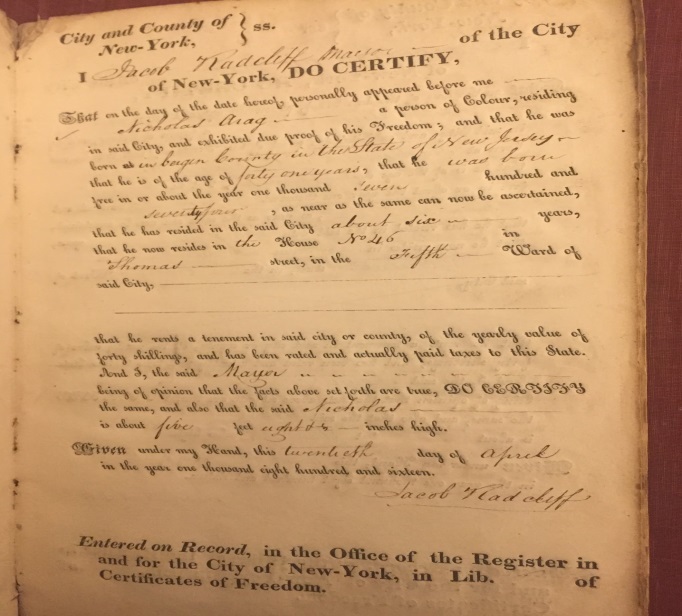 The New-York Historical Society’s Library houses countless treasures, including a manuscript containing certificates of freedom issued by former mayor of New York City, Jacob Radcliff. The manuscript held certificates of freedom issued in April 1816. These certificates listed the free man’s name, address, place of birth, height, and age, as well as the date on which he was freed, the date the certificate was issued, and how he became free—as in, whether or not he was born free or became free. The certificate was completed by the mayor’s signature and served as insurance and protection for free Black Americans in the North. It is a likely assumption that Commeraw had one of his own in order to protect himself and his pottery shop. At a time when Black Americans were considered to be property, having a certificate of freedom meant being considered a human being with rights and liberties. In fact, in Pittsburgh, Pennsylvania, these certificates protected free Black Americans who could have been easily accused of being escaped fugitives and then captured by slave catchers. The template for the certificate required that the certificate holder “Rents a tenement in said city or county, of the yearly value of forty shillings.” This statement brings about questions of property requirements and the many possible hurdles a property requirement would put in front of Black Americans who wanted to obtain their freedom. The unfortunate truth is that placing obstacles in front of people of color to restrict them from fully and equally participating in politics and social activity did not end with the Antebellum Period. This injustice continued with poll taxes and literacy tests before the Civil Rights Movement and the current issue of voter ID laws. However, with the rise of injustice came determined and resilient individuals like Commeraw who dedicated themselves to fighting against tyranny, mistreatment, and oppression, while showing the rest of society their creativity, entrepreneurial spirits, and commitment to success and excellence. “When Did Slavery End in New York State?” New-York Historical Society. Accessed August 01, 2016. http://www.nyhistory.org/community/slavery-end-new-york-state. “Milestones in Voting History.” Voting Rights and Citizenship. Accessed August 01, 2016. http://www1.cuny.edu/portal_ur/content/voting_cal/milestones.html. “”Jug” — Museum Collections — Luce Center.” New-York Historical Society. 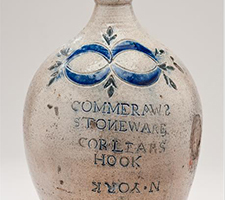 Accessed August 01, 2016. http://www.nyhistory.org/exhibit/jug-52. “History of Slavery in New York.” Slavery in New York. Accessed August 01, 2016. http://www.slaveryinnewyork.org/history.htm. “Explore the Newly Discovered Papers.” Free at Last? Slavery in Pittsburgh in the 18th and 19th Centuries. Accessed August 01, 2016. http://www.library.pitt.edu/freeatlast/papers_listing.html. “Conditions of Antebellum Slavery.” PBS. Accessed August 01, 2016. http://www.pbs.org/wgbh/aia/part4/4p2956.html. Kahn, Eve M. “From Manhattan to Sierre Leone.” The New York Times. 2011. Accessed August 01, 2016. http://www.nytimes.com/2011/10/14/arts/design/commeraw-pottery-and-a-siqueiros-mural.html?_r=0. “Stoneware Jar.” National Museum of American History. Accessed August 01, 2016. http://americanhistory.si.edu/collections/search/object/nmah_574240. “Race-based Legislation in the North.” PBS. Accessed August 01, 2016. http://www.pbs.org/wgbh/aia/part4/4p2957.html. “Race and Antebellum New York City.” Examination Days. Accessed August 1, 2016. https://www.nyhistory.org/web/africanfreeschool/history/context.html. “Free Blacks in the Antebellum Period.” African American Odyssey. Accessed August 01, 2016. ://memory.loc.gov/ammem/aaohtml/aopart2.html.